No Roof Left Behind started in 2009 when the economy took a huge tumble in Michigan and specifically the metro Detroit area. The owners of a local roofing company heard many of the stories from homeowners across the state and were overwhelmed with distress thinking about the hardships these communities were facing. They decided to do something about it and decided to help a family in need by donating a free roof to them. Because there were so many people going through financial hardships, they knew choosing a recipient of the roof would be too difficult to do on their own. The roofing company decided to invite community members to nominate people that could benefit from the project. Stories of good people going through hard times came pouring in from all over Michigan. They narrowed it down to four finalists and left it up to local people to vote for the winner. Neighbors donated time, materials, and services to lend a hand and complete the project for the deserving family. Since then, No Roof Left Behind has expanded into a nationwide campaign and contractors across the country have partnered with them to give back to their local communities throughout the country. Home Solutions of Iowa is now involved with this campaign and we’re excited to give back to an Iowa homeowner in need. Nominations are being accepted HERE now through August 19. The process is simple. 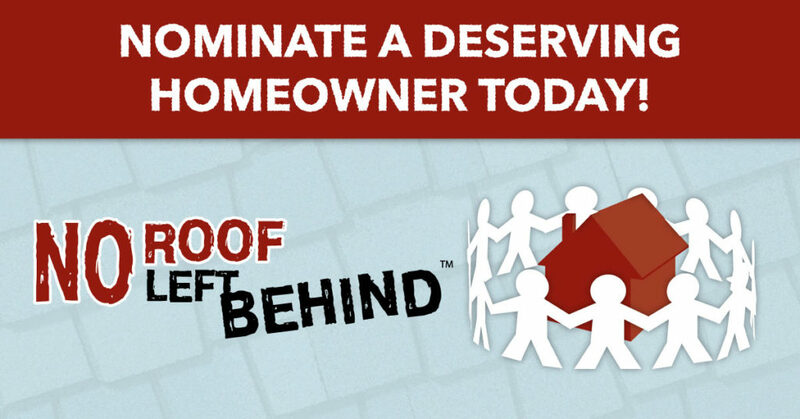 Anyone can participate and nominate a friend, neighbor or family member in need of a new roof. From the submissions, four finalists will be chosen for the final online public voting campaign. The four finalists’ stories and photos will be displayed on Home Solutions of Iowa’s No Roof Left Behind homepage. From August 28 to September 26 the public will able to vote for the finalist they feel is most deserving. The winner will be revealed online on October 3, 2017. Nominees must own the home they are living in and be a resident of Central Iowa. Also, the free roof recipient must be current on his/her mortgage payments. Nominees will be accepted until August 19. A team of local volunteers will review all the nominees and four will be selected as finalists. 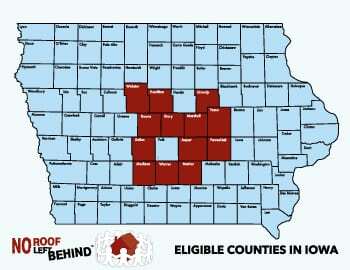 Home Solutions of Iowa joined the No Roof Left Behind initiative to give back to the Central Iowa communities that has brought them success for more than fourteen years. We are proud to be part of No Roof Left Behind. The direct positive impact this initiative has on members of the community is something that can’t be described. It is an honor to be able to launch this here. We look forward to seeing our neighbors and customers come together to help one of our own in need. Other local businesses are invited to participate as sponsors or volunteers. No Roof Left Behind is a great way to rally the community together. There is something for everyone to play a part. You don’t have to swing a hammer or even get dirty to help. Whether looking to donate services, products or time just give us a call and we’ll find a place for you. For more information about Home Solutions of Iowa, our No Roof Left Behind program, or our roofing please call 515-999-2896. Everything was very good from start to finish. - Al H.